In and of themselves, recipes are wonderful. They share interesting ideas, inspire experimentation and introduce much-needed variety to brighten the healthy eating journey. But they also have significant shortcomings, namely, they don’t take us all the way to our healthy eating destination. This is a problem because we’ve been led to believe that the right recipes are all that’s needed to reach the promised land of healthy eating. In reality, recipes can only get us halfway there–so we get left stranded halfway with plenty of good intentions but not the deliciously healthful meals we want. Whether your recipe heap is on counter or computer, is it any wonder that great new–and healthier–recipes never make it to the table? Need proof? 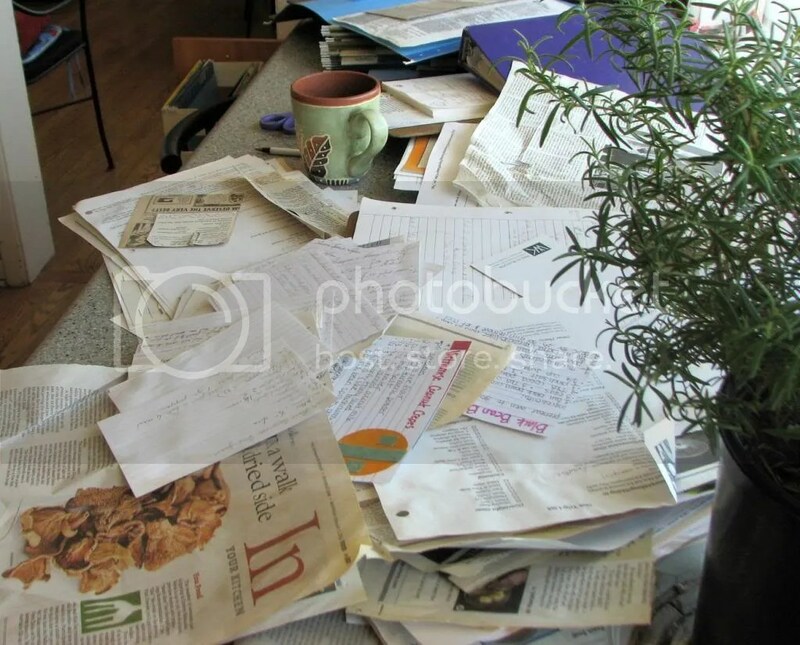 Consider the heap of untried recipes lurking somewhere in your kitchen and you’ll begin to see what I mean. Why don’t all those great, healthy ideas show up on your dinner table? There are plenty of reasons. Many have to do with the way we organize both our kitchen spaces and our cooking time, as explained in my book, Take Control of Your Kitchen. Equally as many have to do with the background knowledge we bring to a recipe. Along these lines, the phrase “reading between the lines” comes to mind. Unless you have (and want to follow) a recipe two pages long, making a recipe requires some reading between the lines, i.e., some foundational cooking knowledge, some understanding of your tastes, some familiarity with ingredients, and some vegetable prepping basics. Absent this “in-fill” information, it can be tough to translate some words and ideas on paper into a satisfying meal on the table. Take the recipe in the previous post: White Fish in Cilantro Broth with Sweet Potatoes and Broccoli. If eating more fish is part of your healthy eating goals, this recipe is perfect. But what if you’ve never cooked fish? What kind should you buy? How do you cook it? How can you tell if it’s done? Is it ok to buy frozen? How do you thaw it? Those kinds of questions could put a quick halt to your fish-eating efforts. But don’t blame the recipe for not providing all this information. Recipes must be written concisely. After all, who bothers with a recipe more than two paragraphs long? This leaves would-be healthy eaters in a quandary. We don’t want to wade through a recipe tome, yet we don’t have the confidence and comfort to make a recipe without more explanation. Is it any wonder that new healthier recipes have a hard time getting to the table? If you face this conundrum, there’s help! Over the course of three to five week meal making series with The New Kitchen Cooking School, we help you develop the unwritten tools and skills to read and make a recipe with satisfying results. Our goal is to help you gain the confidence and comfort to get new recipes on the table efficiently and effectively–then you can make progress on the healthy eating journey. Meal Planning Pointers: Why This Recipe? No doubt you’ve heard the saying, “The hardest part about cooking is deciding what to cook.” Healthy meals certainly won’t show up if we can’t even decide which one to make. A foolproof way to come up with satisfying meal ideas? Let the seasons and seasonal produce be your guide, a sensibility we help you develop in classes. Interestingly, since cilantro is frequently associated with Mexican food, we naturally assume it’s a hot-weather vegetable like tomatoes, peppers and avocados. But this cilantro popped up in the cold days of March and has been growing nicely ever since. For example, this is the perfect time to enjoy cilantro’s bright flavor since it loves spring’s cool temperatures and there is plenty coming up in gardens right now. As the weather heats, it gets leggy, goes to seed and is then fairly well spent until late fall when it can make a second showing. Time Savers: Frozen Foods Talk about convenience: I buy bags of easy to use, individually frozen cod portions that are perfect for dishes like this. Frozen broccoli and sweet potatoes are also great ways to save time. Once frozen, sweet potatoes and broccoli lose a little texture, but their flavor is still perfectly fine. Grocery Shopping: No Time to Shop? Good news. By using frozen white fish, sweet potatoes and broccoli, this dish can be made almost entirely from the pantry. Cilantro is the only must have from the grocery store as it only lasts 4-5 days. Alternatively, start cilantro in your garden, let it go to seed and it will come up every year–right about early spring when it’s time for this dish. Tip 2: Also be sure to gently squeeze water from filets before cooking. Tip 3: Frozen fish is best used in like this, with other ingredients and especially, a flavorful broth to keep it moist. Tip 1: Make sure the rest of the meal is fairly well done before beginning to cook the fish. Tip 2: Once you start cooking it, be prepared to devote most of your attention to monitoring the fish, since every 30 seconds counts as it nears completion. Fish is done when 1) it has transitioned from translucent to opaque (slightly less than opaque for fish (e.g., salmon) that benefits from a more rare treatment) and 2) it “flakes,” i.e., you can easily separate the flakes of the flesh with a fork. Learning to cook fish is best done hands-on, followed by tasting, tasting, tasting and practice, practice and practice. In our classes, we start by showing how to cook it en papillote (i.e., in paper), which is fairly foolproof. We have also been experimenting with an easier, cold-pan method that is more tolerant. 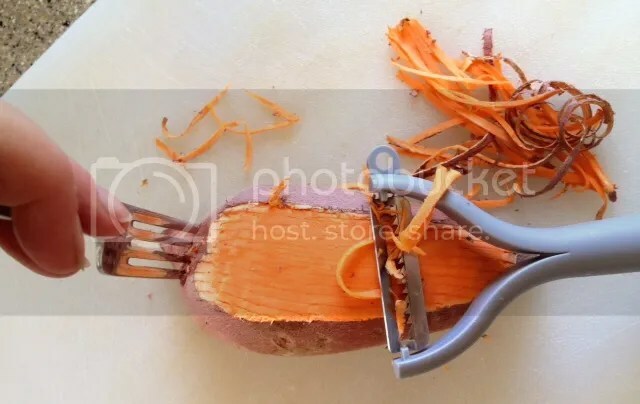 The gray tool looks like a vegetable peeler, but it has sharp teeth that “peel” a vegetable into long strings. While a fork can be used to hold the vegetable in place while julienning, I find it easier to grasp it in one hand while pulling with the other. Don’t be afraid to put a little muscle into the process as sweet potatoes are tough cookies. Equipment: What Does It Mean to Julienne? Vegetables cut into very thin matchsticks are “julienned.” Think shoestring fries. Julienning can be done with a good chefs knife, but a simple, cheap julienner is a much easier way to get the consistent, 1/8″ square matchsticks that are so sweet in so many dishes. When julienned like this, sweet potatoes cook quickly, making them an easy, colorful and nutritionally powerful addition to your diet. Know Your Ingredients: Sweet Potatoes For this recipe, we used an orange-flesh sweet potato (Garnet or Jewel) for the lovely color combination it creates with the white fish and green broccoli. However, a white flesh one would work as well if that’s all you have. Read more about the different sweet potato varieties here, and the difference between sweet potatoes and yams. 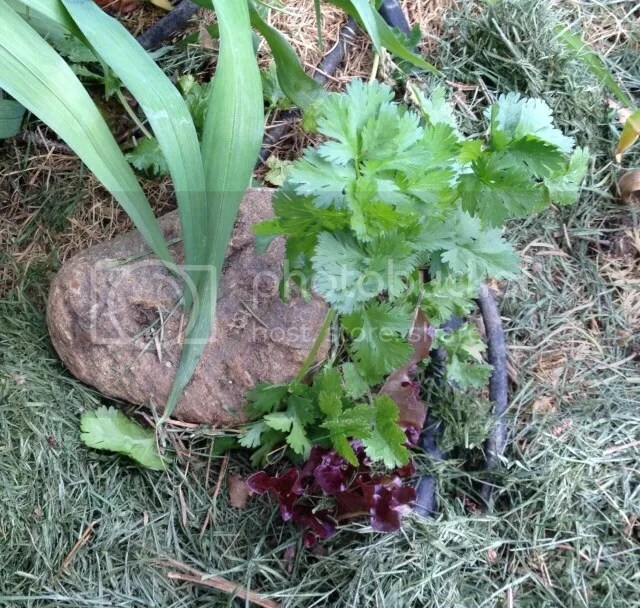 Time and Money Savers: Using Cilantro Stems No need to painstakingly remove the stems from the cilantro. Everything can be used in this broth, saving time and money. In fact, this recipe is a perfect way to use up any stems leftover from other recipes. Cooking Technique: How Long Do I Cook the Broccoli and Sweet Potatoes Doneness is the balance point between a vegetable still tasting raw on the one hand yet not tasting overcooked or mushy on the other hand. Tasting is the only and best way to discover where this point lies for you. Tip: Even after you think something is done, try cooking just a little longer to make sure you don’t like it better that way. 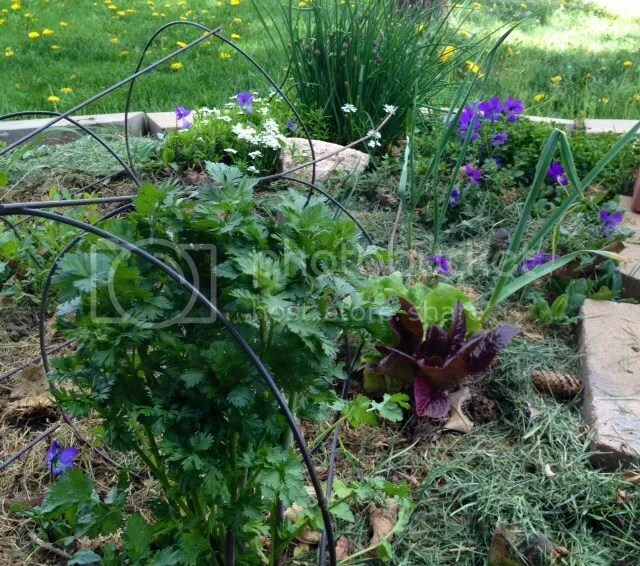 One more pretty picture from my garden–just because the cilantro is so sweet by the little blue Corsican violets!